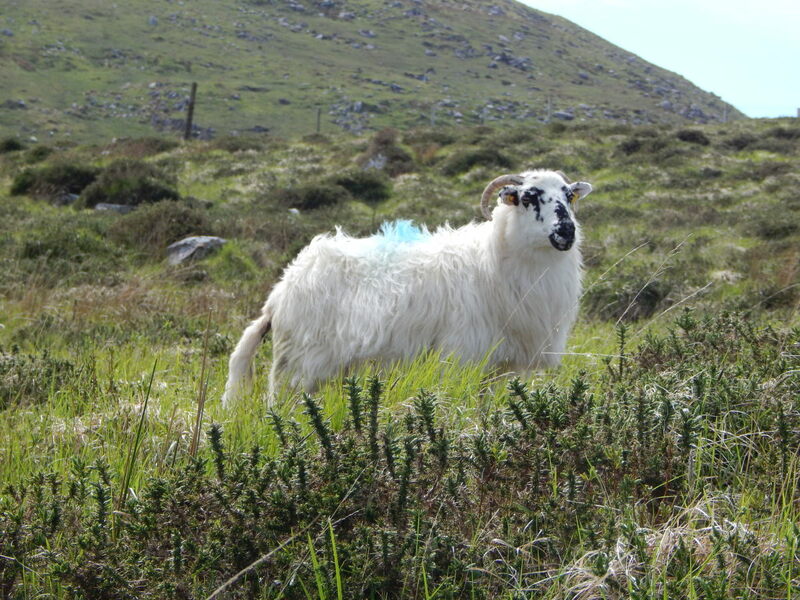 The South West of Ireland is not short of scenery to make your heart flutter, and the Dingle Peninsula in West Kerry is a popular destination for visitors who enjoy being in the outdoors. The region caters for every taste, from lively pubs and night entertainment, to the remote isolation of a sweeping coastline and rugged mountain trails. The area is rich in history, with plenty of sites that are recognised internationally for their importance. Museums in the area explain much of the history, displaying a lot of the finds from the region, and I would recommend that you visit as many of these as possible to gain some background knowledge on the vast diversity of historical sites in the area, before setting out to see them yourself. 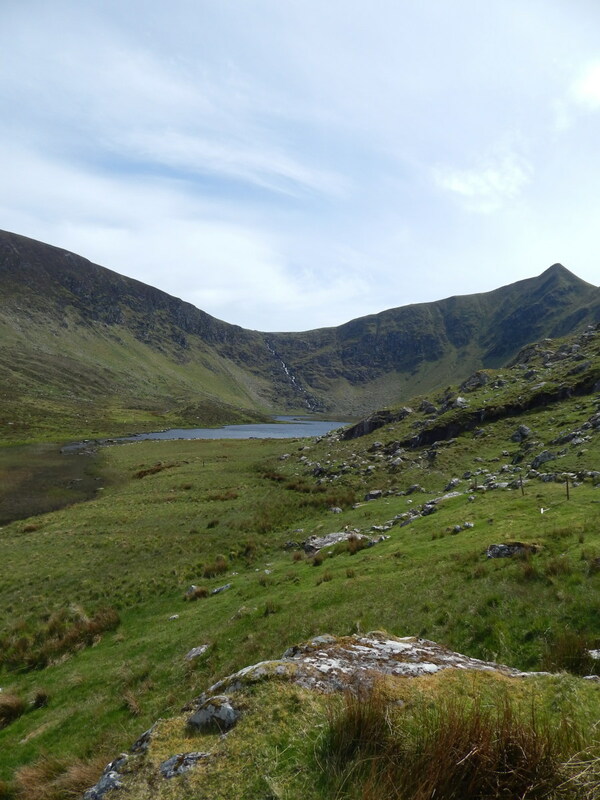 The best way to explore, is on foot, and in this article, we look at the Loch a'Dúin Valley (Anglicised as Lough Adoon) in the shadow of the Conor Pass. 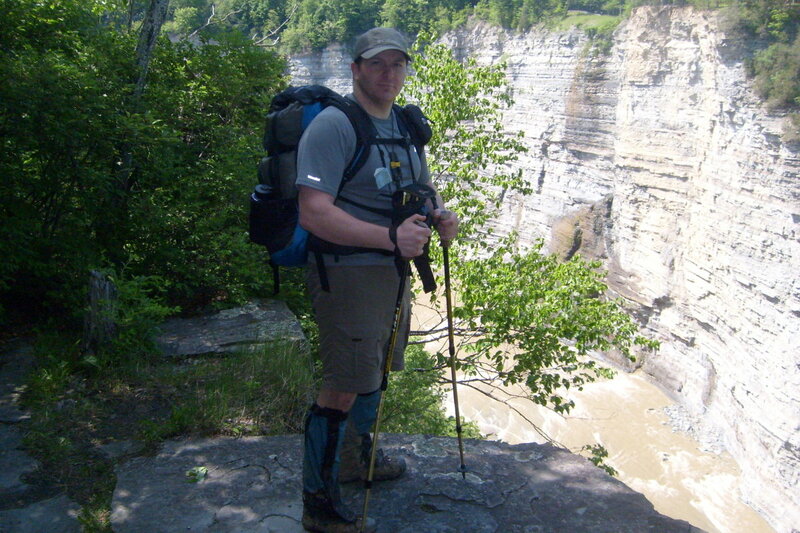 If you enjoy walking, history, and geology, then you're most certainly in for a treat! Meaning "the lake of the fort", Loch a'Dúin contains a huge amount of monuments from the Bronze Age onwards. A recent count suggested that there are as many as 89 stone structures in the valley, some of which are over 2,000 years old . These include a wedge tomb, rock art, a cooking site (fulachta fia), standing stones, and field walls that were erected long before the peat settled in the valley to form the bog. There are over 12 kilometers (7 miles) of ancient walls, which have been dated to around 1,300 BC, making them over three thousand years old. The history is extraordinary in this place, and all of it can be found at your leisure if you have the time and the eye for it. A circular walk takes you around many of the more easily spotted monuments, which are marked out with black wooden posts. These compliment a walking guide; a photocopied booklet that is available from Clochane stores, opposite the church. 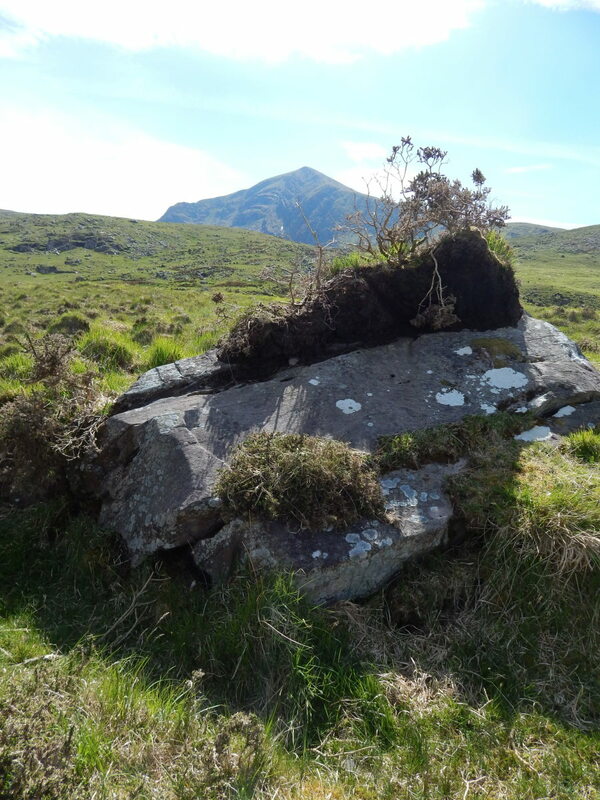 The guide includes "The Archaeology of the Loch A'Duin Valley" by Michéal Ó Coiléain, along with a map of the walk with the sites marked by the wooden posts and descriptions of what they are. A detour into the village to pick up a copy is well worth your while. Starting at Kilmore Bridge, this circuit will take around three hours to complete. 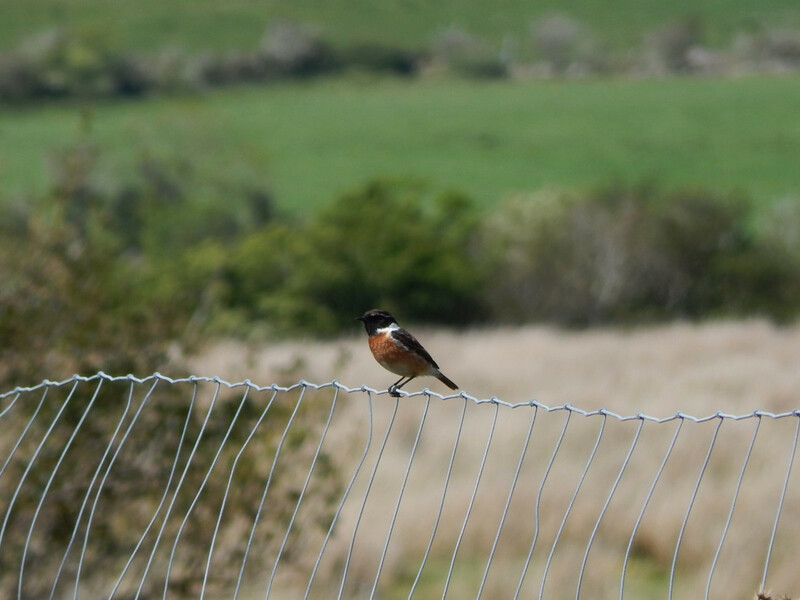 Lovers of geology, botany, and bird spotting will also enjoy this walk, as it provides a peaceful setting to study the unspoiled beauty of the Dingle Peninsula and its mountain wildlife. The start of the walk takes you along an idyllic grass path which even in bad weather is blissfully pleasant. The views of the mountains around you are a tantalising reminder of the valley and geology to which you are heading. Twisted trees dot the landscape, stunted by the rocky terrain and shaped by the winds that blow into the valley from the sea. Everywhere you look, the eye is drawn to a bleak beauty that nature so casually paints upon the landscape. As you continue, the land becomes more peaty, and soon the path growing ever wetter, takes you through a peat bog towards the loch. 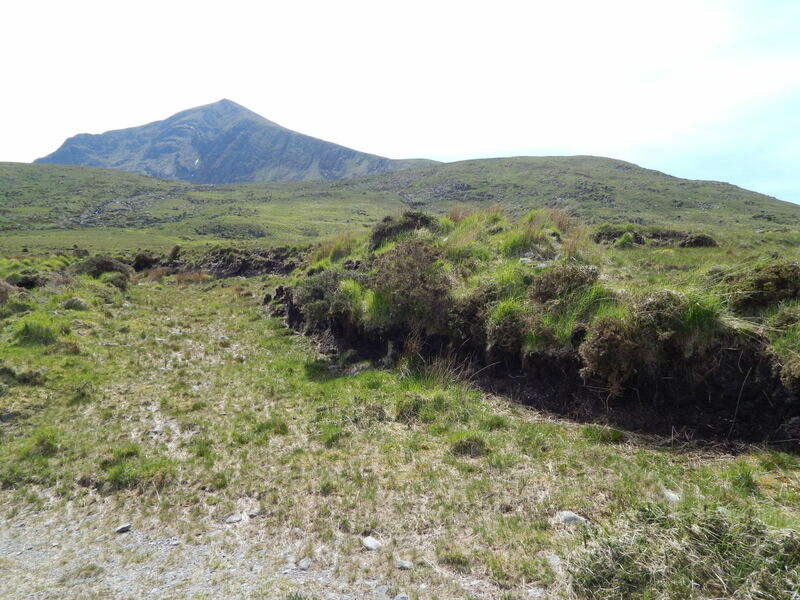 It is the peat that has preserved the antiquities of the area, and it is quite possible that the people using this valley so long ago, were key to a change in the landscape. 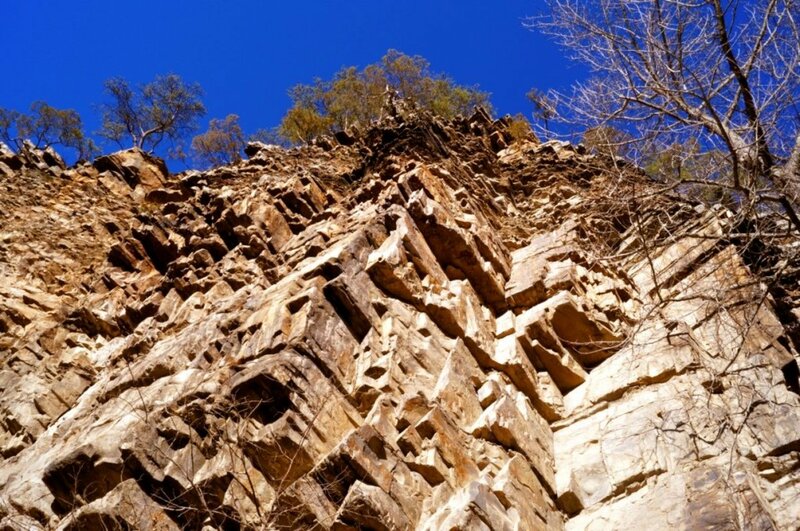 The region's mountains were formed by glacial movement during the last Ice Age which ended around 11,700 years ago. The glaciers scooped out the valleys and dumped their boulders as they crawled across the ancient landscape. As they melted, they left behind Loch a'Duin and numerous other lakes in the area which are known to geologists as a corrie, circe, or cwm. Pollen studies from the valley show that in the post-glacial period, it was an open woodland filled with birch, willow, and grasslands. 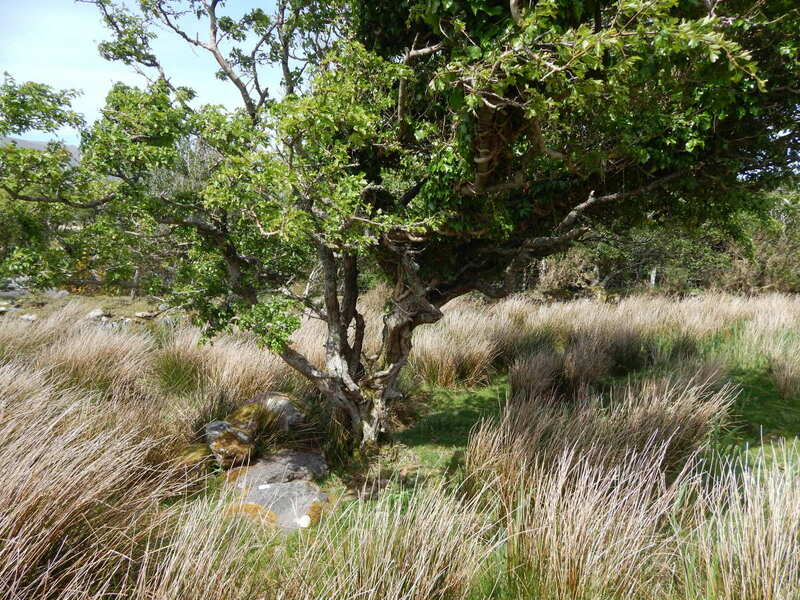 Around 7,500 years ago, the woodland had matured and was dominated by oak, hazel, elm, and pine. Around 4,500 years ago, the woodland began to decline, and cereal pollen began to appear. This suggests that agriculture came to the valley, with woodland being cleared to make way for crops. Around 5,800 years ago, modern man settled on the Dingle Peninsula at Ferriter's Cove, near to the Loch a'Duin valley. The evidence from the pollen studies would suggest that soon after, they moved into the valley and made their impact on the landscape. The monuments and ruins scattered about would suggest that it was a bustling community for its time. They were to be victims of their own success; eventually, the crops and cattle impoverished the soil, and the bogs began to form. The early farmers left the valley, and it was abandoned to the mountains until around 600AD when it was used again during the early Christian period. The land was farmed for a further 150 years before it was once more abandoned . With the Scorid river to your left, one of the first sites of interest that you come to is a fine example of cup and ring rock art. This motif appears all over ancient Europe, but the examples in this valley are believed to be of the Galician style. A depression is made in the stone, with two circles drawn around it. It is not known for sure what this motif means, but it is thought to have served a ritual purpose. This symbol appears further up the valley, and I personally wonder if it was the "coat of arms" of its day of the people that first famed the valley? 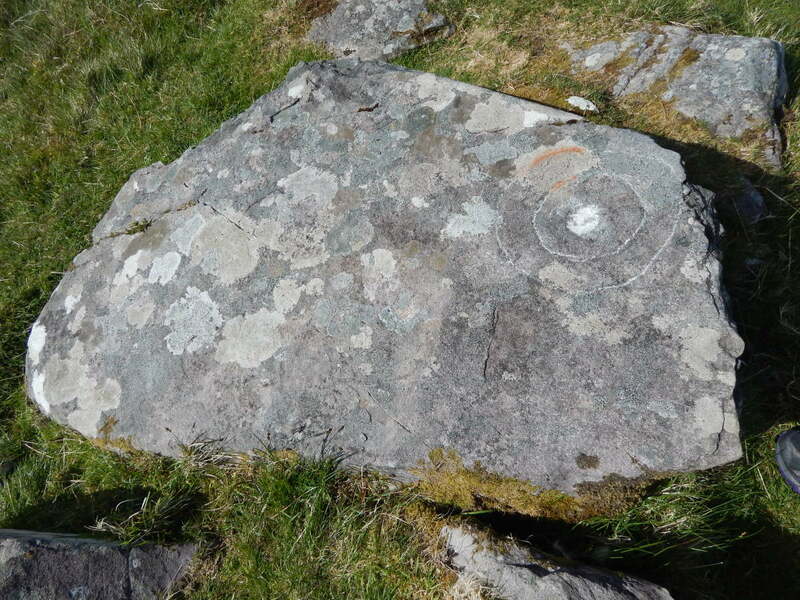 This rock art is well preserved, although later visitors appear to have run a stone around the central dent and outer rings of the art making it appear at first glance to be a new carving. Many of these monuments can be seen along the trail. What makes them unusual is that they are not the pillar shape that we are used to seeing. They instead appear to be deliberately cut to mirror the profiles of the mountains in the area. Some bear cup indentations, suggesting again that this symbol was some sort of message or territorial statement. Perhaps even ritual in nature, symbolising the sun rising over the mountains? Many standing stones are believed to mark the places where people died, or their ashes were left, or they could just simply be boundary markers. Whilst they are probably used for all sorts of purposes, we will never know for certain why each individual stone was erected. At the end of the path, the going gets more rugged. The Scorid river that runs from the lake passes through a marsh, forcing you to walk along more mountainous terrain to walk around the loch. 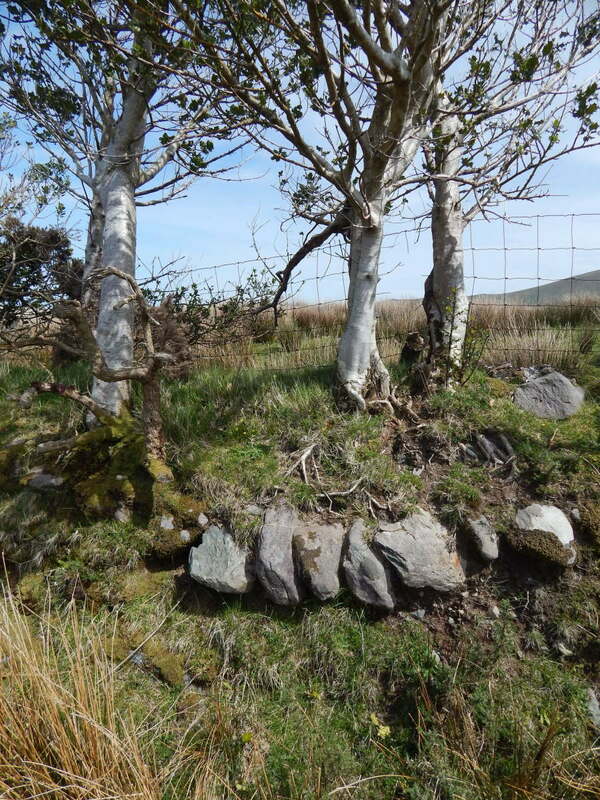 Along the west bank of the river, on the summit of a small hill, can be found a wedge tomb, known as the Ballyhoneen Wedge Tomb. 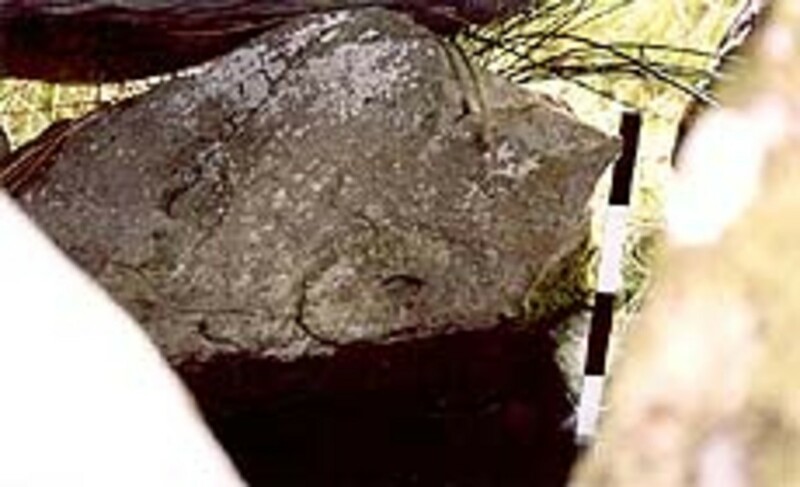 The tomb was subject to extensive study by Judith Cuppage , and by the late Dr Blaze O'Connor  who recorded the details of cup and ring rock art on the inside of the tomb. This style is described as being Galician, which can be found in Ireland, Britain, western France, and Iberia. Legends of Ireland's past suggest that the Milesians may have been the people that arrived to Ireland from Iberia, and their distinct style marks their migration across Europe. 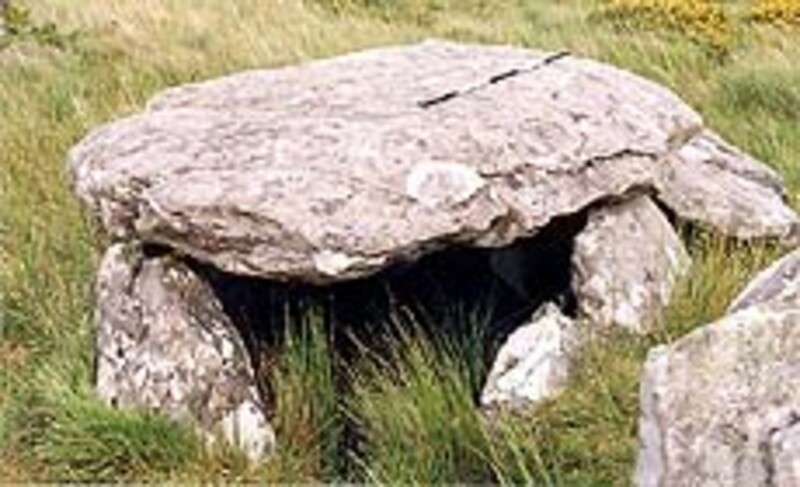 Wedge tombs are believed to date from somewhere between 2400 and 2000 BC, making them the burial sites of the period of transition between the Neolithic and Bronze Age. Anglicised as Dooneen Island, meaning "Little Fort", the isle in the centre of Loch a'Dúin is site to a ruined defensive stone fort. No great study has been made of this fort, so it could be as late as Mediaeval, or as early as Bronze Age. The fort is made using dry stone, in a technique known as corbelling. The water of the loch on the eastern shore is only about 30cm deep, so it is possible to paddle across to explore the site. The walls of the fort are in some places over 2 metres (roughly 6 and 1/2 feet) tall, and 2.5 metres (7 feet) thick, so it would have been quite a defensive stronghold when it was in use. I can only assume that it would have been used to protect the local community and their livestock during times of attack by raiders to the valley. With Viking raids, and later the Normans arriving in this part of Ireland, it is plausible that the fort could have been built by the early Christian community, which would make it around 1,300-1,000 years old. Only radio carbon dating will determine the exact age. 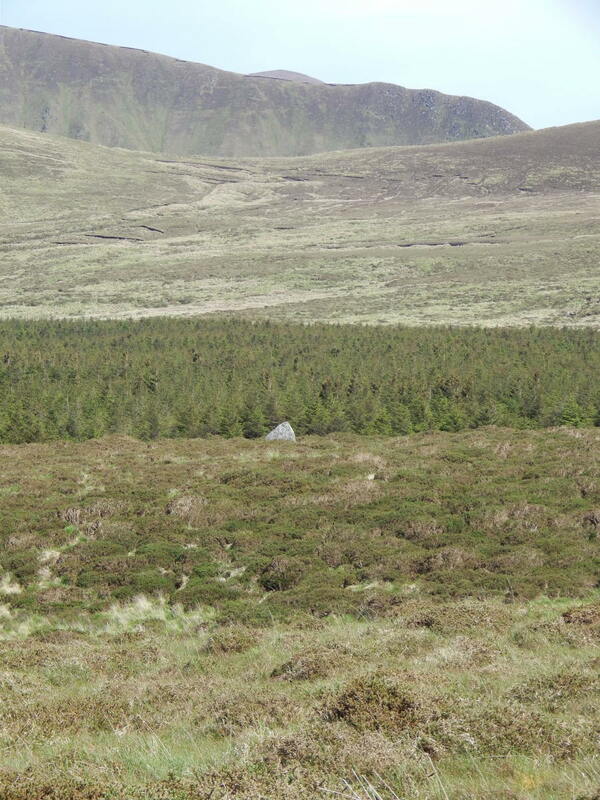 Walking past the waterfall at the head of the valley, a group of beehive huts or clocháns can be seen. Now in a ruined state, these are believed to have been built by early Christians, or the local community who sought isolated spots to retreat to during the Norman invasion. With their proximity to the fort, I would think that they are built by the same community that built the stronghold on the island. Originally, these huts would be dome-shape in appearance, similar to a bee skep (a type of bee-hive, woven like a basket). Their similarity in shape to a bee hive gave them their colloquial name. They were made with corbelled dry stone, with an open doorway. I would speculate that these would be covered with earth and turf to keep them insulated, and have some sort of door to keep out the wind. Turfing of stone dwellings is common in places such as the Faroe Islands and Iceland, and is a cheap and efficient roofing material. Hundreds of these huts can be found in County Kerry, most notably around the Dingle Peninsula. Whilst in now ruins, these clocháns speak volumes about life in the valley in centuries past. Sitting among them for a moment, looking over the loch, one can't help but imagine the struggle against the elements that their inhabitants would have faced. 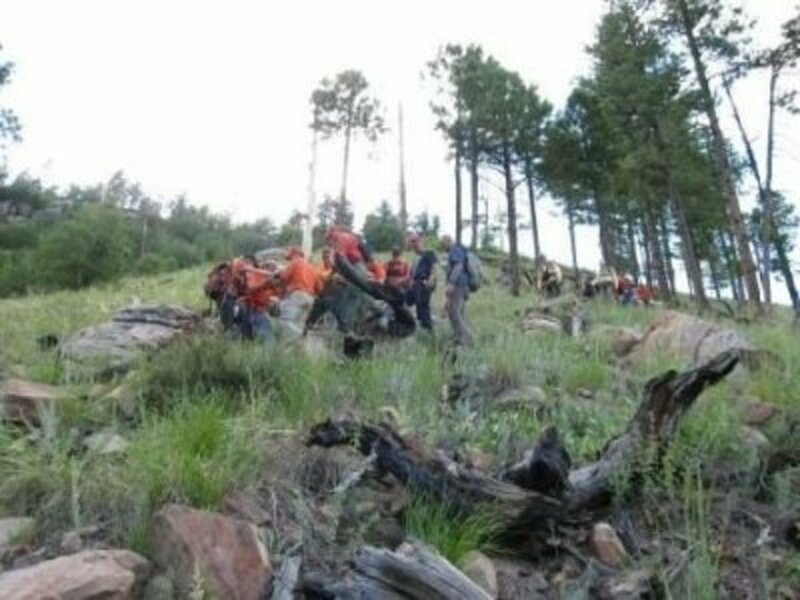 A struggle that they would eventually lose, leaving the valley to nature once more. Loch a'Dúin is located along the Dingle Peninsula in County Kerry, Southwest Ireland, a short distance from the small town of Clochane (Clóchán sometimes spelled An Clochán). The valley in which it sits is on the north facing side of the mountains, between Sliabh Na Leice on the west, and Sliabh Na Gower to the east. 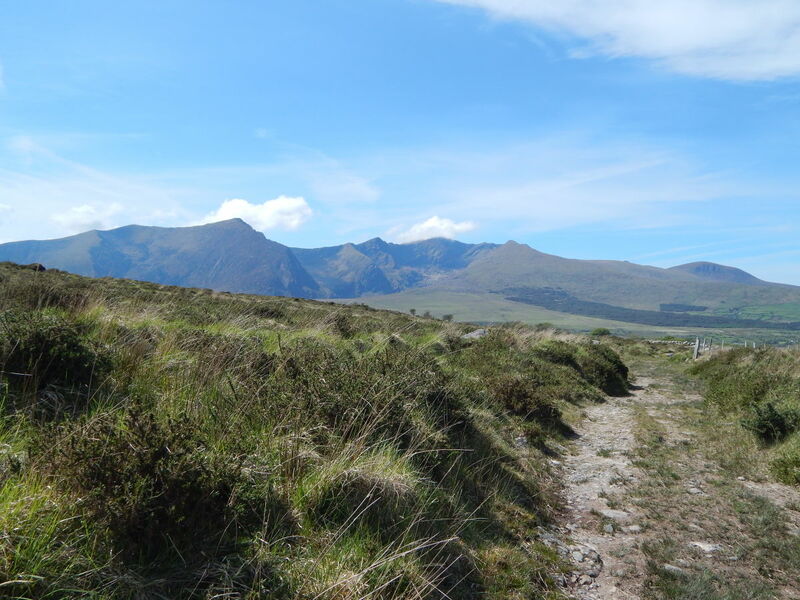 The track for this walk can be found directly opposite the road junction of the road running southeast from Cloghane with the Conor Pass road, leading to Dingle. There is a gravel verge where you can park your car; the gate to the walk is opposite this point. Loch a'Dúin is the teardrop shaped lake near the bottom of the map, slightly east of centre. 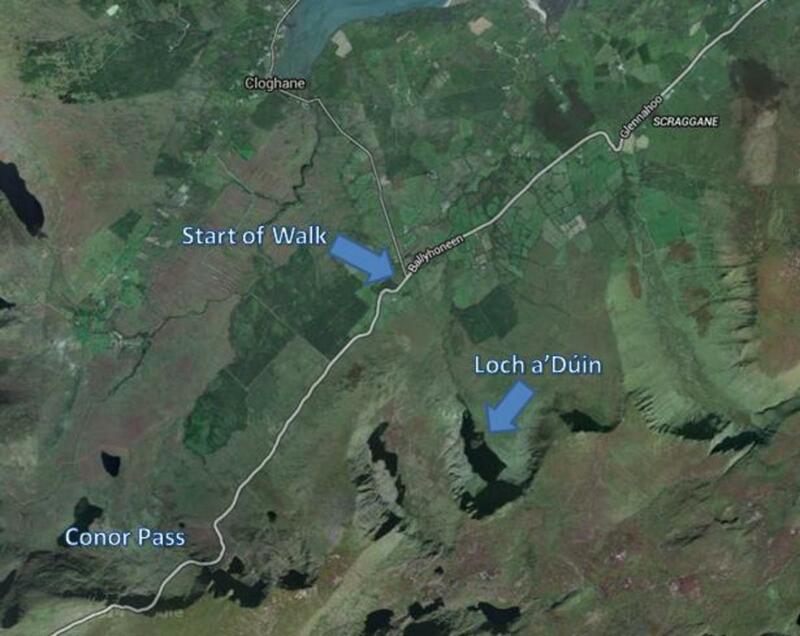 The most direct route to the Loch a'Dúin valley is straight over the Conor Pass from the direction of Dingle. Ireland's highest mountain pass, the road itself provides some incredible views. From the top of the pass, Brandon Bay and the valley before it can be viewed at your leisure, and I would certainly recommend a stop at the parking area to enjoy the landscape. The road then snakes down towards the bay, taking you past dramatic geology and the odd waterfall before levelling out near Cloghane. It is important to be aware that this road is very narrow, and it is a frightening journey for those of you that are nervous with heights. It is not at all suitable for coaches. If the weather is bad, or if there is low cloud, it is not wise to use this route. 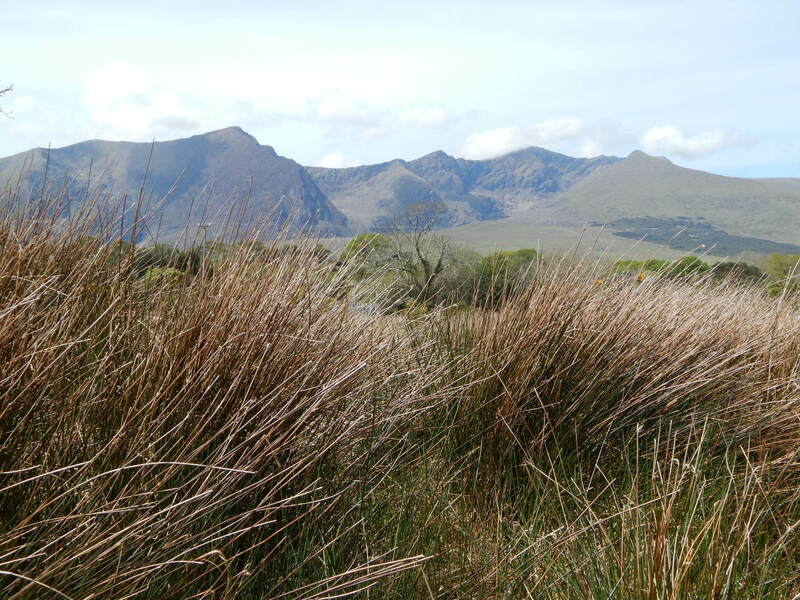 If you prefer a more gentle drive, then you can reach the Loch a'Dúin Valley from Castlegregory (Caisleán an Griaire) which is found to the east, down the road from Tralee (Trá Lí). It has a bearing of 52°12'48.0"N 10°09'43.7"W (52.213337, -10.162135), and can be found in the Ordnance Survey Discovery map 70 with coordinates 524089 (for simplicity, this is nearly halfway across easting grid 52, and near the top of northing grid 08). A link to the map you will need can be found below. I'd certainly recommend it for exploring the area. Start of route marked, 2.5km south east of Clochane. The majority of the walk is on a fairly flat path, although it is unmade ground so is quite uneven, stony, and sometimes boggy in places. Much of the walk is suitable for families with small children, the older walker, and people with some mobility discomfort, although the fact that there is a kissing gate at the start of the walk means that it is not suitable for wheelchairs. There are a few high stiles along the route; almost ladder-like in structure with rails to hold that will get you over the walls dividing the valley. If you have trouble climbing then you will struggle with these. There are a couple of streams to cross, via narrow stone foot bridges. A good sense of balance is important, as is the ability to walk along a narrow slab over a drop into water. Whilst not very high or deep, it could injure you if you fall off, or at the very least soak your picnic! The closer you get to the loch, the more difficult the terrain gets, with the path pretty much disappearing and turning into a sheep track. 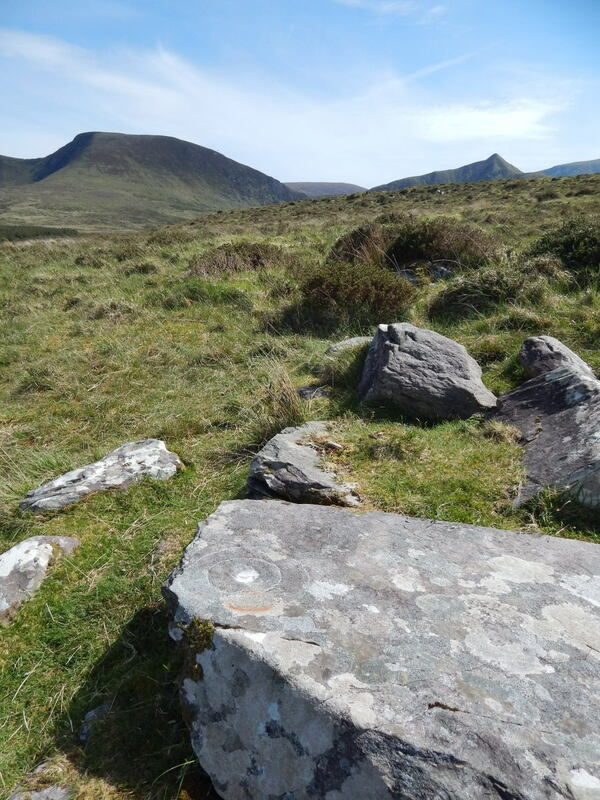 Being in the beautiful wilds of the Dingle Peninsula, there are no facilities nearby so do make sure you have been to the loo before you set out. I strongly recommend you also take plenty of common sense with you! Take note of the weather, wear the proper gear (and sun cream! ), take a drink and a snack, and make sure you have a map and a means of communication in case you get into trouble. Remember to take nothing but photographs, and leave nothing but footprints! So thrilled to read this Sara, and that you enjoyed your walk around the valley. It's a really lovely spot. I have had a hunch for years that, due to the engravings in the Megalithic Tomb, it might have some astronomical significance a la Newgrange. I recently discovered that,at the Equinoxes, the sinking sun, passing through a "V" formed by two nearby Mountain Spurs, brilliantly penetrates the tomb with beams of golden light. Pure magic to have witnessed it. I have photos and video of the occasion. Because of this beautifully written piece, I went for a ramble to Loch A Duin on my trip to Ireland. It was the highlight of the trip - wild, secluded, and magical. Thank you so much. Billy, what a wonderful photograph! It really makes me miss the place. I can't wait to go back there, those valleys really do inspire you. Thank you for sharing. Do you mind if I share it on my Facebook writer's page? Great Article, thanks for sharing. I have 3 photos from there namely 29th and 19th September. Thought you might like them! I remember reading an article about Dingle in a travel magazine as a teenager. Very impressed by its beauty. AliciaC, thank you so much for your comment. This combination indeed does make it fascinating to explore, but the way that human history impacted on the landscape makes it all the more interesting for me. This is a wonderful hub. I would love to explore the area that you describe. A combination of nature and history would be fascinating to see. The photos in this hub are lovely and the information is very interesting! Thank you Carolyn, it is such a peaceful and beautiful place. Kevin, thank you for reading. I really would recommend it if you enjoy walking. I'm glad I read this hub! Next time i take a trip to Kerry i'll definitely look for this place. Thank you. Loved this one and your photos made me feel like I was there. Thank you Jodah! It is amazing to learn about the history of the valley. So easy to pass it all by and miss it. It certainly is one of Kerry's hidden treasures. This was a very interesting hub about a place I was unfamiliar with Pollyanna. Thank you for this very comprehensive hub on this intriguing area. Voted up. srsddn, thank you very much! It is a fantastic place, and one of my favourite walks. Pollyanna, beautiful exploration. Your description makes one to walk through the history. It is interesting to know it got inhabited and abandoned. Thanks for sharing. Voted up, interesting and useful.